To be a successful merchant, you must be keen, quick sighted and most of all, patience is the key to success. If you are none of those, then don't bother becoming a merchant because you will be quickly bored. So let's get started already! Money Needed: 25,000gp or more. On almost any world, travel to the part with the willow trees (right next to the bank) and start buying all the willows you can afford, (don't worry about losing all your money, if you do this right, you should get even more than before!) for no more than 20gp each. Once you have a decent amount of willows, bank them, note them and switch to world 1 and sell them for 30gp each in Draynor bank. There you have it. Willow merchanting. Easy to do and probably the most common way of merchanting. Buying more willows means you can make even more money, so just risk it, and buy as many as you can to make larger profits of cash. Money Needed: 250,000gp or more. A good way to make profits of around 100-200k very easily is to merchant death runes. 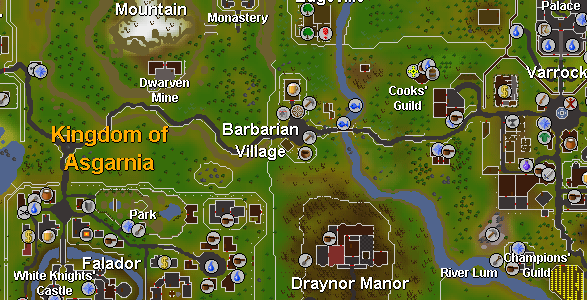 Varrock is a good place to start this. Go to the runes shop ( ) in an empty world. Now that you have over 1k of deaths (recommended), it's time to swap to world 1, making sure that you are still in varrock. Now head over to the west bank once you've loaded the world and start selling the deaths you bought for 250-350 each. Don't go lower or you will not benefit from the larger profits. As you may have noticed after selling the deaths, you've become a lot richer than before. Enjoy the extra cash! This is one of the prime ways to make a lot of easy and quick money and can also be used in the same way on chaos runes. Just follow the same order (although you will get less of a profit by using chaos). Another good way to make large profits of money is with yew merchanting. 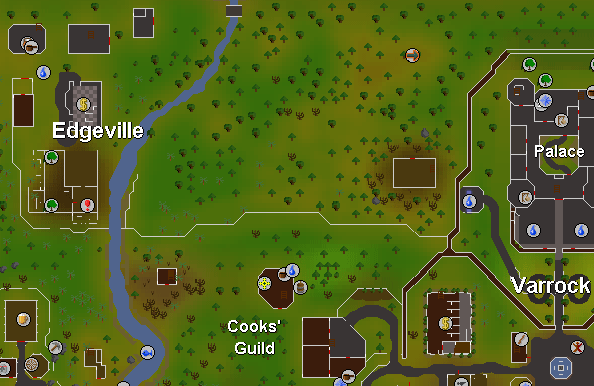 Go to the part of Edgeville where the yew trees are on almost any world and start buying yews from people chopping the trees there for 250 each. Once you have done this and have around 1k yews, go to varrock west bank (one without stairs) and sell to people for 300-400 each and making your quite large profit of 30k or more. Another way to make large profits of money is by Coal merchanting. 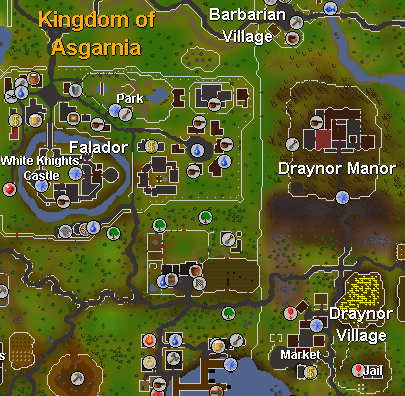 Now, go to Falador east bank (next to Mining Guild) on an empty world such as world 62 and buy all the coal you can for 120 - 150 gp each. Buy around 1k or more, depending on how much of a profit you want to make, then bank and note it all and transfer to world 1 (when possible). Staying in this same bank, start selling all of your coal to people right outside the doors of the bank for 180 - 220 each! Once done, guess what? You've made yourself an easy 30-40k profit! Note: You should receive about 30-40k profit for about 1k of coal. Try buying more than 1k coal to increase your profit! This is a common way to make even larger profits of money from merchanting and it is called Big bone merchanting. To start (make sure you have around 300k), simply go to Varrock west bank and start buying as many Big Bones as you can for 300 each. Don't bother trying to buy over 1k or more Big Bones in a not-so-populated world, because most people will transfer to world 1 and sell there instead. Once you have around 1k (or more) Big Bones, go to world 1, same bank, same place and sell all of them for 400 each! There you go, although it can take a long time to buy all those Big Bones, the huge profits you can make should keep you quiet! Money Needed: 300,000-400,000gp or more. Law rune merchanting is a slow, but rewarding way to make profits of over 100k! To start: Go to varrock west bank, world 1 and 3 and buy as many law runes as you can for 150-180 gp each. This should take quite a while, seeing as laws are hard to obtain and buy. Once you have about 1k of laws, it is time to sell them, so sell them all 200-300 each and guess what? You've just made a very good profit! That was an easy 100k+! Money Needed: 1,500,000gp or more. A good way to make high profits is Steel bars Merchanting. First go to World 1 or 3 Falador East bank and start buying steel bars for 550-600 each. You will get small amounts of steel bars, but in no time you will have 1,000 to 3,000 steel bars. Now wait until the "rush hour" (Mostly around 3:30 - 5:00 GMT) and go sell your bars for 650 - 700 each. You will make a profit of at least 50,000 to even 300,000! Sometimes, higher leveled buy for 650 each. But it doesn't happen everyday. Remember, that not every runescape player out there is innocent. When trading, make sure that the person you are trading with knows what you want to trade, just to prevent self- frustration. Always remember to check the final trade screen before you accept, because you might get scammed without notice. If this does ever happen to you, find the person you were trading with and report them immediately, under the case of 'item scamming' to help stop them from scamming anyone again. Never loose your cool- Always keep calm and if you start to get frustrated at someone, take a break and resume work somewhere else; don't get yourself too angry that you might get yourself a black mark (from a warning), because after 3 of them, you're finished. It can help to be a high level when you are merchanting so that people will look up to you and from this you can even manipulate prices to suit your money limit. If you forget a price for an item, you can always check out the Item Database for help. Well, that's it from me, I hope you have enjoyed not only reading this guide, but making your easy money. Soon you'll be on your way to becoming rich and successful (that is if you aren't already!). Thank you, and remember to always check the trade screen before a trade!